Of the Motley School, Minneapolis, Minn. Formerly Supervisor of Primary Schools, Minneapolis, Minn.
in green and the natural color of the raffia . And look, I used the same pattern (basket weave) for towels, many years ago! Bed shoes of all sizes are easily woven, and make a useful holiday gift. They are made without soles and are intended to be drawn up around the ankle like a high moccasin. Use the soft double Germantown wool. White, fastened together with pink or blue, or white striped with a color, may be used, and are attractive. The socks in the illustration are of white wool with a pink seam up the instep and pink scallops around the top. 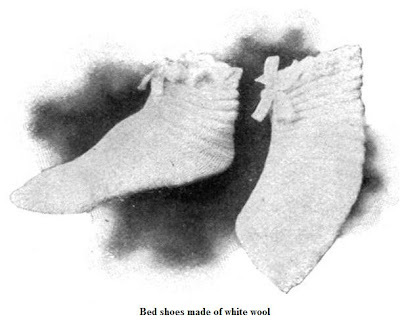 One sock is shown on a last, and the other as it appears off the foot. 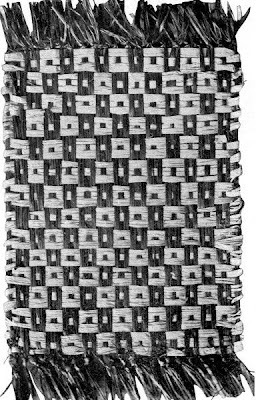 The stripes in the knitting can be shown in the weaving by using a color. The full size of the loom makes a shoe of medium size. String a close warp with white wool. If the shoe is to be all white, weave with the same, leaving the color for the finishing. 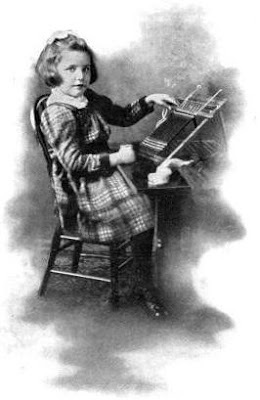 If it is to be striped, weave perhaps eight or ten times across with color and then with white; when the weaving is finished you will have a mat 9 × 12 inches. Double one of the short edges and sew over and over on the wrong side with white wool. This is the toe. The two long edges now lie together. They may be crocheted, or knitted, with colored wool by holding them close and fulling in, or by puckering a little. If this is done in color, it makes a pretty seam on the top of the foot and front of the ankle. The top may be finished by crocheting a beading and scallops of the colored wool. Run a ribbon or worsted cord through the beading. If desired, the long edges may be laced together with ribbon one-half inch wide. Baby shoes are made in the same way. To ascertain what length to adjust the loom, measure the sole, then up, back of the heel, to a point above the ankle. For the width, measure around the foot. Finish the cord with tassels or balls. This was one of today's find at Gutenberg. It also have suggestions for songs and games. 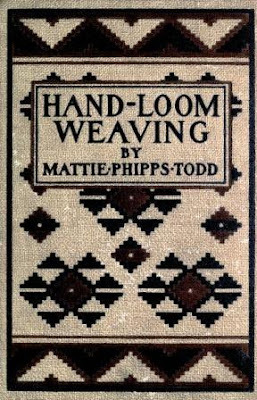 The following weaving song in the Walker and Jenks book can be sung during the weaving. To be sure it is not really "over and under" when you think of them as children. Remember that they represent a mat, and they are for the time the strips and border. (Sung to the tune of "Nellie Bly.") Anybody knows this tune? Then we do the same. Come and weave with me! A happier band than we! "First choose a row of children for threads of the warp, standing at such a distance from each other that a child may pass easily between them. Second, choose a child, or children, for thread of woof. After passing through the warp, each child takes his place at the end and other children are chosen." In this way more children can take part than if a tape were used. Some teachers play it in a different way, using the desks with the seats turned up for the warp and the whole number of children for the woof, winding in and out all over the room. This is very delightful, indeed, if there is enough space for the children to pass easily without tripping on the iron supports of the desks. This is a good game for a rainy day, when there is no outdoor recess. 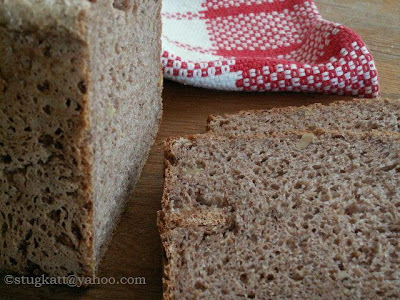 If you want to see how far spring has advanced around my house, head over to my Swedish blog. I have never heard that song. It might not sound quite as sophisticated when kids sing it though! What a wonderful post! Your tea towel is amazing. I have always admired weaving and think that looms are beautiful. I just don't know if I would have the patience, especially the stringing of the loom. It seems you would have to have a mathematical mind, which I don't. There are so many different things you can weave. You don't have to put up a weave with 2000 fine threads (the kind I like), a rug with 300 threads in the warp is also fun! Yes, weaving is quite mathematical and logical - but nothing you can't handle with the help of a calculator.